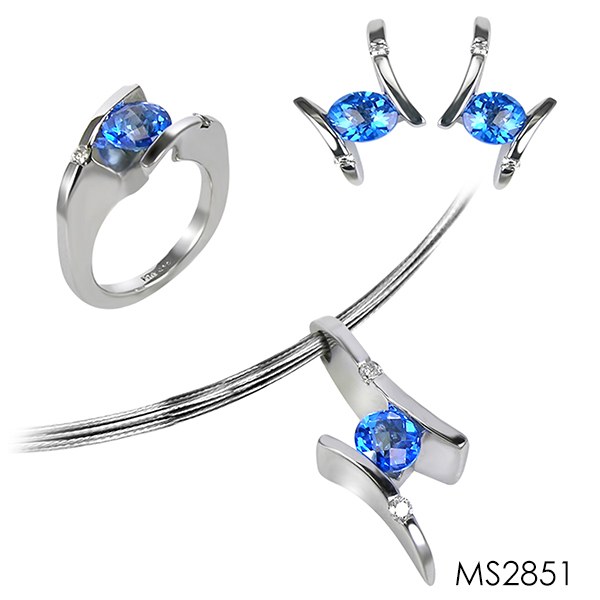 This Sterling Silver suite features a Kashmir Blue Topaz set, including a Pendant, Ring and Earrings. The pendant (MSP2851/WS/KBT) includes an 7mm Round Stone with 6pts White Sapphire. The earrings (MSE2851/WS/KBT) include an 6mm Round Stone and two 2pt White Sapphires in each earring. The ring (MSR2851/WS/KBT) includes an 7mm Round Stone and 6pts White Sapphires. The additional set tray image shows the set in Kashmir Blue Topaz (as pictured in the original picture) as well as rings in Peridot and Pink Topaz.